Students will see and learn first hand the role of directors, camera operators, sound engineers, and more. They’ll have front row seats to observe and learn the logistics of producing a DVD. 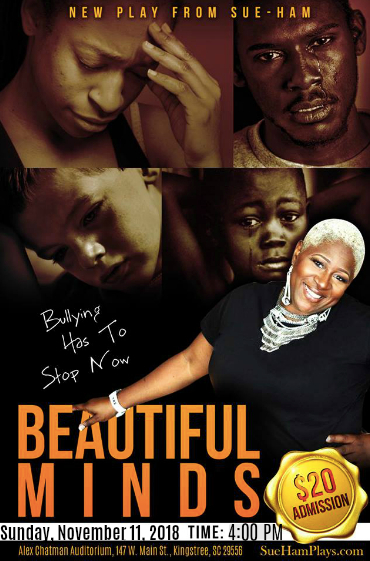 Beautiful Minds is a theatrical stage production which talks about the reality of the issues kids are facing today with bullying, misunderstandings, learning how to forgive, and how parents and educators deal with those circumstances. We’ve brought together kids from all over Williamsburg county (some first time actors) to bring a face and voice for those that have, and are dealing with these everyday issues. Beautiful Minds is promised to bring you the drama, comedy, and enlightenment you have come to expect and have received from Sue-Ham’s previous original works. You may get more info and or tickets at www.suehamplays.com – Please no children under seven admitted to the show.